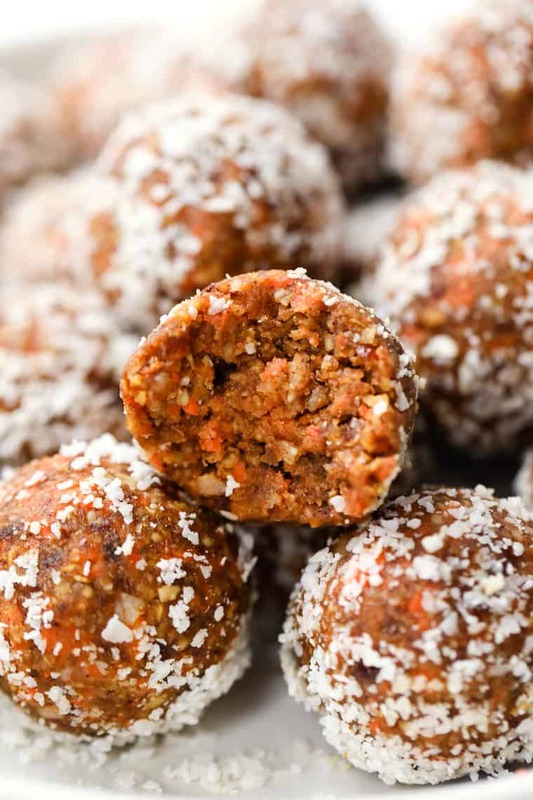 These healthy carrot cake bites remind you of an indulgent slice of cake, but are actually good for you! They're vegan, no-bake and seriously delicious! Wouldn't it be great to have all dessert in bite-sized form? Sure it's awesome to have a whole slice of cake sometimes, but most of the time I'm cool with just a bite or two. Which is exactly where energy bites come into play. 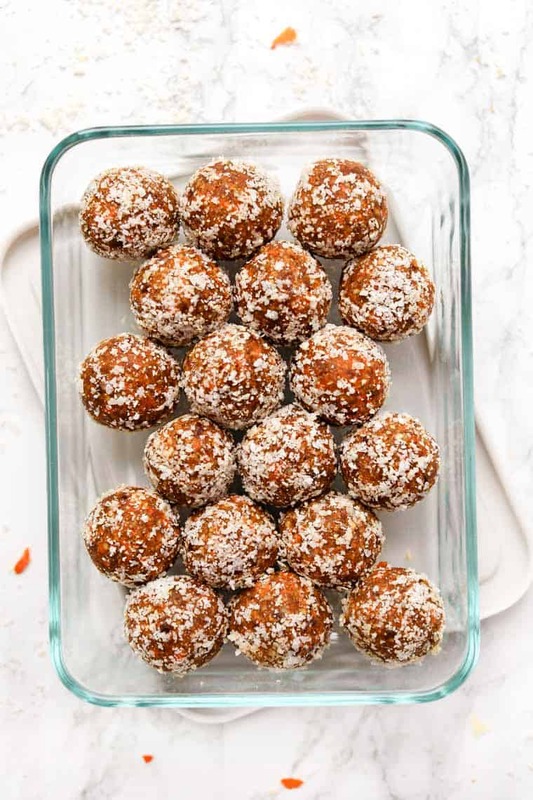 Energy bites, and other no-bake ball-shaped treats, are the ultimate way to get your dessert fix without having to a) bake and b) overstuff yourself. One bite, the craving is satisfied and you're feeling good. We've got a few other dessert-inspired flavors on the blog already, but today it's all about carrot cake! I wanted to keep things as traditional as possible with the flavor combo which is why we're using pecans, cinnamon, and nutmeg. The coconut and oats are there mostly for texture, but they also add a little sweetness. The cashew butter and dates both help to bind everything together, but they're also awesome for flavor. The dates add natural sweetness, but have caramel undertones which are so good. Cashew butter to me is like the ultimate treat. 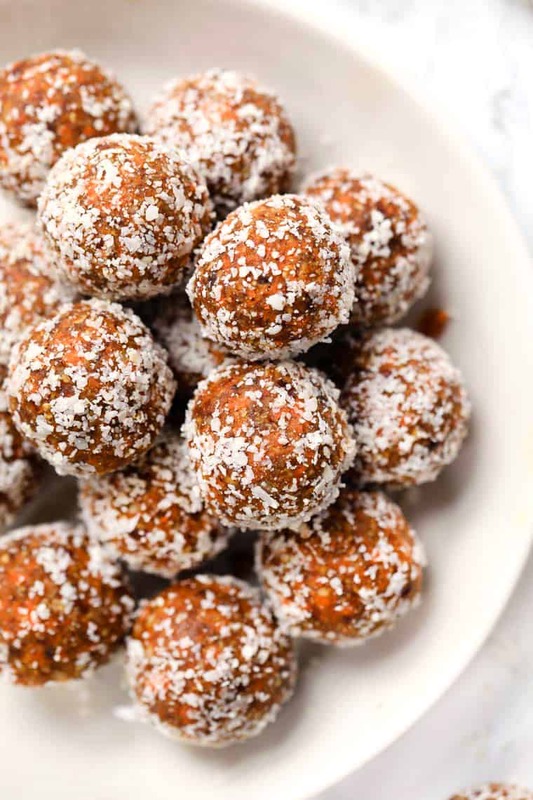 It's naturally sweet, it tastes kind of decadent and it's delicious in energy balls. And finally, we're rolling these cuties in some coconut to make them look extra special! 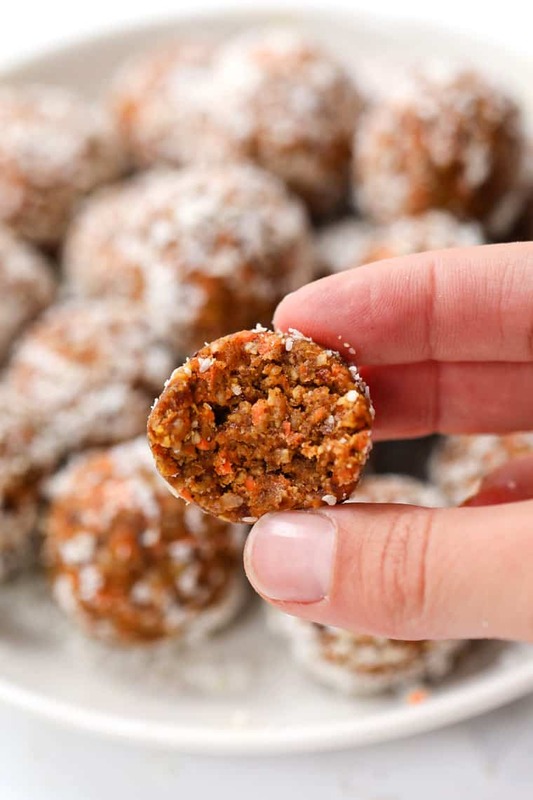 I'd say that these little carrot cake bites are the ultimate snack. 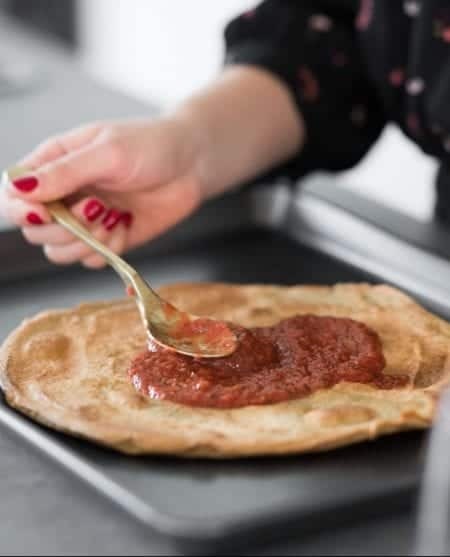 They're great for a quick mid-morning nosh, but also can be enjoyed as an on-the-go brekkie (just grab like 3 – 4), or an after-dinner treat. Those are just one of the many reasons why I love making energy balls at home. 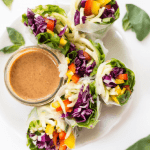 They're portable, they're easy, they're delicious and they're actually healthy! Just look at these nutrition facts: around 100 calories, 2g of protein, 4g of sugar and 2g of fiber. That's better than most granola bars! 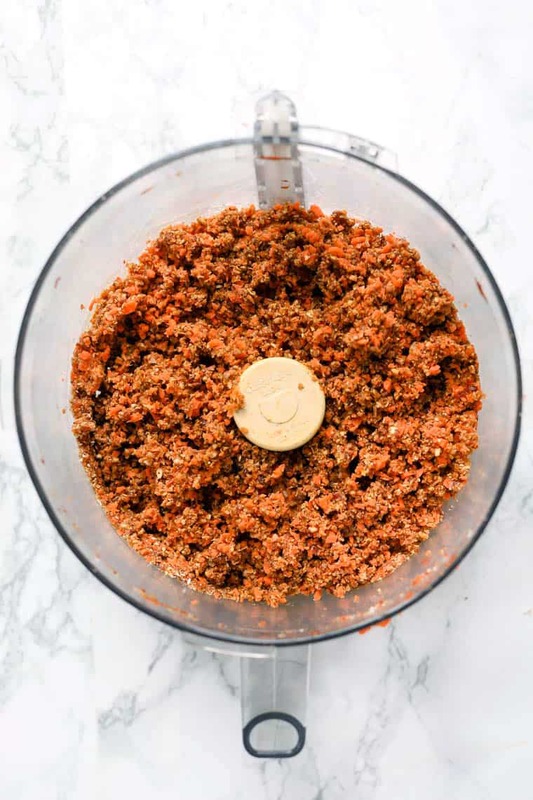 Add the carrots into a food processor and blend until finely chopped. Transfer to a bowl. Return the bowl of the food processor back onto the base and add the pecans and coconut. Pulse to form a sandy texture. Add the oats and dates and process again until a sand texture has formed. Add the remaining ingredients and blend until a dough comes together. Shape the dough into tablespoon-sized balls. Repeat until all of the mixture has been used. Place the shredded coocnut in a shallow dish and roll each ball in the coconut to coat it. Place balls in an airtight container and store in the fridge for 1 - 2 weeks. Carrots come in varying sizes. What is the measurement or, better yet, weight of the amount of carrots for this recipe? Thanks. About two cups of carrots will work! This is confusing. Why does it say one cup of carrots in the recipe and 2 cups here? 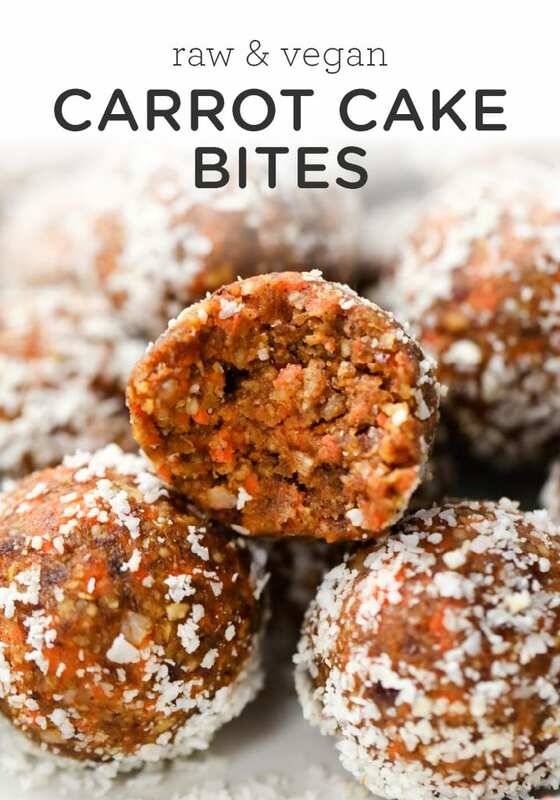 Mmmmm, we actually had similar carrot cake bites for our wedding, but all piled up into a pyramid! 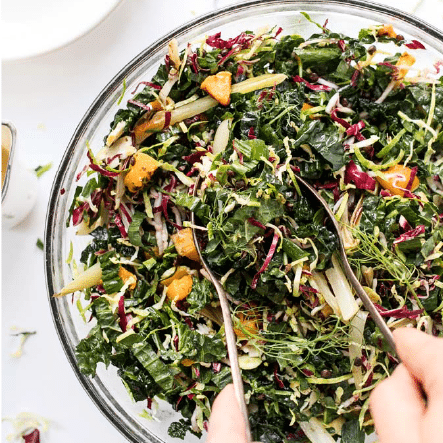 This looks very good, I have most of the ingredients have to just get the pecans, I don’t have a food processor will a vita mix work for this? Ate these at a friends party and thought I was cheating! I found out ingredients and had to make them at home! My vegan daughter loves them too! So delicious and nutritious 🙂 Thank you! Yay! That just made my day 🙂 So happy you enjoyed them. If you like these little babies, you should check out the carrot cake smoothie I posted this morning. It’s like drinking cake for breakfast. Yum! They have awesome flavor, I wish they weren’t quite as soft but they are still a keeper! Thanks for the yummy recipe! I’m going to make this recipe and I’m just wondering how much 5 medjool dates weighs? My guess is 3/4 cup (120g), but maybe it’s only 1/2 cup (80g)? (I’m using dates, but not medjool). I would say it’s about 1/2 cup. Let me know how they turn out for you! These sound amazing! OMG, what a great idea! I will be definitely trying these! With my love to protein I might add some here. :) What do you think? Great recipe, thanks! These were delicious and were even enjoyed by some kids. 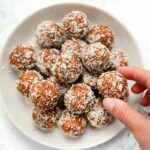 I tried these using dried and unsulfured figs and they turned out really good for a healthy snack. I’ve been making green tea with almond milk. It’s my new favorite drink! Oh, yummy! 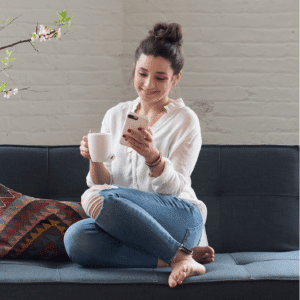 I’ve pinned this to try later. Thanks!